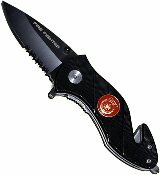 Fire Fighter Rescue Pocket Knife Spring Assisted Opening - Heavy duty Fire Fighter rescue pocket knife with enamel medallion mounted into the aluminum handle. This firefighter rescue knife features a surgical steel drop point blade with thumb stud. Rescue knife includes seat belt cutter and glass breaker. Handy pocket/belt clip. Spring Assisted Knife - Press the back, and it flies open and "snaps" in place.